A star receiver at Arkansas, where he caught 48 passes for 814 yards as a senior in 1937, Benton was chosen by the Rams in the second round of the 1938 NFL draft. His 19.9-yard average on 21 catches as a rookie led the league and he topped the NFL with seven TDs among his 27 receptions in ’39, when he was a second-team All-NFL choice and selected to the Pro All-Star Game (predecessor to the Pro Bowl). Benton took a year off in 1941 to coach high school football in his native Arkansas, but he rejoined the team in ’42. 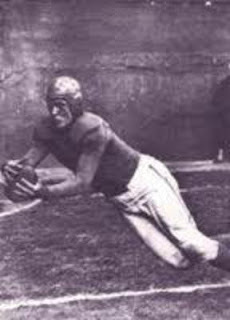 Due to the Rams suspending play for a year in 1943, Benton played for the Chicago Bears and, while his numbers dropped off, he was a key receiver in clutch situations for the NFL title-winning club. He rejoined the Rams in ’44 and achieved new personal highs with 39 catches for 505 yards. Rams went 9-1 to finish first in the NFL Western Division while leading the league in rushing yards (1714). Won NFL Championship over Washington Redskins (15-14). With the franchise moving from Cleveland to Los Angeles, Benton followed up his outstanding 1945 season by leading the NFL in both pass receptions (63) as well as receiving yards (981) in ’46. He was again a consensus first-team All-NFL selection. Benton played one more season for the Rams in 1947, catching 35 passes for 511 yards (14.6 avg.) and six TDs. Overall, over nine seasons he caught 288 passes for 4801 yards (16.7 avg.) and 45 touchdowns, with all but 13 receptions, 235 yards, and three TDs occurring while with the Rams. Benton was a consensus first-team All-NFL selection twice and received at least some second-team honors following two other seasons. He was chosen to the NFL All-1940s team selected by the Pro Football Hall of Fame as well as the Arkansas Sports Hall of Fame. Benton’s NFL single-game record of 303 pass receiving yards lasted until 1985.